The form Grey Lock took in people’s dreams was mostly a creation of their imaginations – few settlers had seen him. We only know from the name settlers called him that he had a streak of prematurely gray hair. 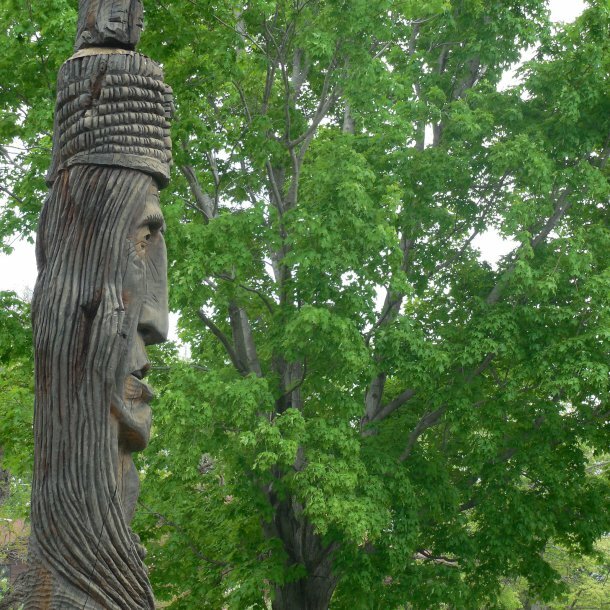 His Abenaki name, Wawanolewat, tells us more about his tactics. It means “he who fools the others.” Grey Lock may have seemed an avenging demon to settlers, but he had reasons for his actions. By the early 1700s, the people of the British colonies were outgrowing the land they had settled along the coast of New England. Now they were pushing inland. The movement of settlers into western Massachusetts and Maine inevitably caused conflicts with the Native Americans already living there. By the early 1720s, the Abenaki had had enough. They issued an ultimatum to the governor of Massachusetts, demanding that he block more British settlers from moving west and occupying new territory. As a compromise, they said that existing settlers could remain. The colonial government responded by declaring war on the Abenaki. It was during this period of struggle that Grey Lock became a name colonists feared. They had known of him since 1712, when he had led a raid on British settlers in Northampton, Massachusetts, during what was known as Queen Anne’s War. That war was part of the struggle between Britain and France for control of North America. This new war, however, would not be between European powers, but between British colonists and Native Americans. Read the full column by Mark Bushnell in VTDigger.org.